Mike Aponte (also nicknamed MIT Mike) is a pro blackjack player and the former MIT Blackjack Team member. INQUIRE: The MIT Blackjack Team was considered to be a group of students and former students from the Massachusetts Institute of Technology and Harvard Business School + University who employed the card counting systems and more keen strategies and techniques to beat the gambling houses at blackjack all over the world. The team functioned successfully from the year 1979 up to the beginning of the 21st century and won millions of dollars at blackjack tables. Thereby Mike Aponte is considered to be one of the MIT leaders who later became a team manager as a result. Mike was never fond of playing cards in his childhood. Being a son of US Army tactical instructor our hero travelled a lot, the USA and overseas both. Aponte changed 11 schools before he graduated the Ewing High School in New Jersey at last. The year 1988 he moved to Boston and started his economics study in MIT. At the same time Mike played on the football school team. The story achieved its dramatic turnaround when at the senior years Mike got to know about the MIT Blackjack Team from one friend of his. The team used math techniques to win blackjack variations and this fact has attracted young hero much. Mike Aponte once said that it was a fascinating experience when he first time attended the MIT Blackjack Team training. The big money accessibility and new lifestyle has turned his head. Aponte was eager to master the card counting techniques and thus practiced hard in order to develop his count skills. In the 1992 our hero being a MIT member first hit the casinos. It is believed that Aponte was one of the most successful and gifted MIT players. Up to the 2000s Mike Aponte and his team performed an incredible run in the USA casinos plus other countries as well. They won millions, met celebs, partied at the best and hottest nightclubs and led the lifestyle the other might only dream. Such a success was possible due to hard-work approach and wise management. 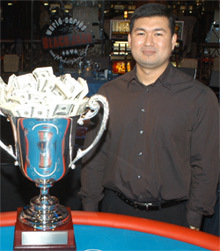 Being a former pro blackjack player Mike Aponte have won the 2004 World Series of Blackjack competitions and also co-founded a company named the Blackjack Institute. This firm provides the players with services and instructional products on how to perform blackjack successfully and win money regularly. Mike launched his personal web-site - mikeaponte.com - and started his consulting and coaching career. The main character of Bringing Down the House best-seller book (author Ben Mezrich) is prototyped from Mike Aponte actually. The same book was also made into a motion picture 21.